When StogieGuys.com first reviewed this line (both the Churchill and Robusto) almost a decade ago, Master Blends 3 was the latest iteration of a limited edition that greatly enhanced Oliva’s standing among cigar enthusiasts. Now, while Oliva still refers to Master Blends 3 as the third in “a series of limited artisanal blends,” you can find them almost anywhere. The lightly pressed Torpedo (6 x 52)—one of a trio of available Master Blends 3 vitolas—has a list price over $14, but I’ve seen them as low as $4.25 per stick online when bought 20 at a time. Master Blends 3 remains a fine smoke, worthy of the strong ratings it garnered in both previous reviews. It kicks off with a burst of cedar that recedes after about a half an inch. Soon, other flavors advance. Along the way I enjoyed tastes of nuts, leather, and sweetness that moved between syrup and cinnamon. The Nicaraguan ligero filler provides a kick and some pepper, especially in the final third. My only complaints include a fairly flaky ash and several touch-ups being required on each of those I smoked. Not that that was surprising, given the thick, oily nature of the dark sun-grown Broadleaf wrapper that encompasses the Nicaraguan Habano binder. Each line in the Master Blends series sports a different wrapper. I never smoked the first, but I fondly recall Master Blends 2 as a terrific smoke. There’s been an occasional rumor that Master Blends 4 is on the way. So far, however, rumor is all that’s come out. And with the sale of Oliva a few years ago (in 2016, Oliva was acquired by the Belgium-based J. Cortès Cigars N.V., a family-owned business focused primarily on machine-made cigars) and former CEO José Oliva stepping down this year to devote more time to politics, it’s even less clear whether anything will happen. Hopefully, at some point there will be a Master Blends 4 release. I’d like to smoke one. Until that time, though, we can enjoy the Master Blends 3. For me, the Torpedo is equal to its siblings and also rates four stogies out of five. I have to admit, I hadn’t heard of Patina before wandering into Casa de Puros, a retail tobacconist and lounge near my home in Forest Park, Illinois. Despite the shop’s well-appointed selection, the Patina Habano caught my eye almost immediately. 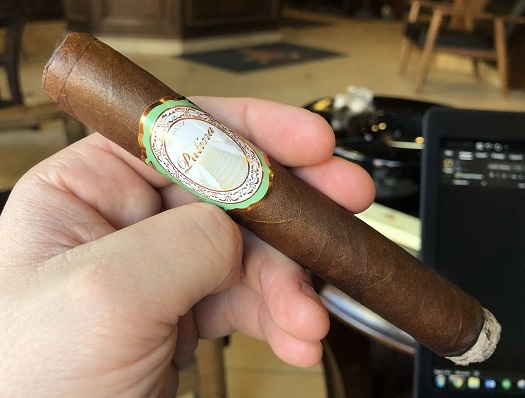 Something about the beautiful, uniform, milk chocolate-colored wrapper—and the way that wrapper is contrasted by the classic, understated band of white, bronze, and mint—helped differentiate this cigar from its competition. I used a double-guillotine to neatly clip the head off one of the Patina Habano Bronze specimens I bought for $12.95 apiece and settled into one of the chairs in the lounge. Notwithstanding the cigar’s firmness, the cold draw was fortunately smooth. I took note of the pre-light aroma of green raisin before setting a wooden match to the fragrant foot. Once fully lit, the combination of the Ecuadorian Habano wrapper, Nicaraguan binder, and filler tobaccos from Nicaragua and Pennsylvania yield a spice-forward, full-bodied profile of leather, macadamia, and black pepper. There’s a gentle sweetness—especially on the aftertaste—that I’m tempted to call cherry-like, but that’s not quite it. Maybe it’s more like cream soda? It’s a tough flavor to put my finger on. I enjoy it nonetheless. The taste adds balance and complexity to what might otherwise be a somewhat monotone cigar. Patina’s two lines, Connecticut and Habano, debuted in May 2017. Both are offered in four sizes. In the case of the Habano line, those formats include Rustic (5 x 52), Copper (6 x 46), Oxidation (6 x 56), and the toro-sized Bronze (6 x 52) I’m smoking for this review. Around the midway point, the sweetness recedes as earth, hay, and a bready texture emerge. While the smoke production, solid white ash, and draw are all excellent, the burn leaves something to be desired. I had to touch-up and re-light a few times to keep things even. The Bronze is a slow-burning cigar. It took me two hours and twenty minutes, to be exact. And that marathon comes despite puffing with a greater frequency than usual to ward off the need for more re-lights—a practice that renders the smoke a bit hotter than I would normally like. That probably contributes to the intensification down the home stretch. In the final third, the flavors don’t change much, save for the introduction of cayenne heat and peanut, but they do become spicier. I don’t regret purchasing a few Patina Habano Bronzes. That said, I can’t see myself going out of the way to buy more in the near future. I will give the Connecticut line a try, though. If you’d like to experience this (or any other) Patina, you don’t have to travel to the Chicago area; a full list of retailers is available here. In my book, the Patina Habano Bronze earns a rating of three stogies out of five. When Fuente introduced this line almost a decade ago it went with one trend and against another. Cigars at that time were starting to get bigger, and Magnum R included four vitolas with ring gauges above 50, including a then-monstrous cigar (6 x 60). Many cigar makers were also gravitating toward more powerful blends, seemingly competing to see who could get farthest up the Scoville scale. Not Fuente, at least not with Rosado Sungrown Magnum. 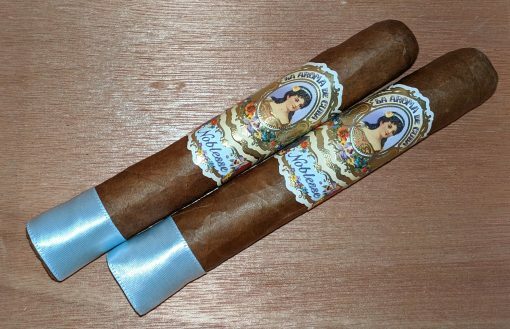 The blend of a thin sun-grown Ecuadorian wrapper and Dominican binder and filler was designed to be a flavorful smoke with medium strength. For my taste, they got it just right. From the wrapper’s pre-light floral aroma to some light pepper in the final third, Rosado Sungrown Magnum is a most enjoyable smoke. The first note I registered was a sweetness at the start. Within a short time, leather and nuts began to intermingle with the sweetness. 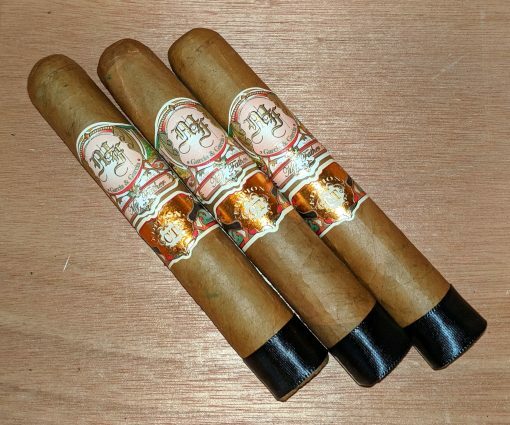 As with many Fuente cigars, flavors in the Rosado Sungrown Magnum are nicely balanced. Rosado Sungrown Magnum is not a highly complex cigar, and changes along the 6.25-inch frame were fairly subtle. Frankly, though, I wasn’t eager for the profile to morph too much because I found the overall experience so pleasant. For this review, I smoked four Magnum R 54s. (The number denotes the ring gauge for all but the 44, which is named for the number of smokes per box; it has a 47 ring gauge.) Each burned slowly and evenly. Smoke production was excellent, with a light finish. The draw was near perfect. At a retail price of around $8.50, I consider it a bargain. 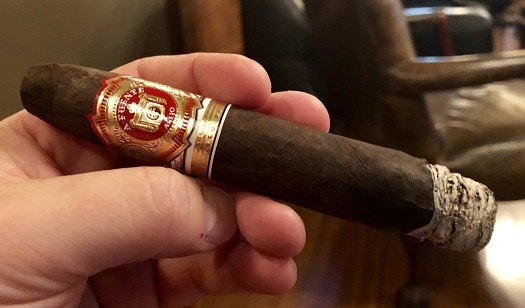 For those of you who favor Fuente’s more high-profile cigars such as the various Opus iterations or the elusive Shark, give the Rosado Sungrown Magnum line a try. I think you’ll be pleased. I rate it four stogies out of five.